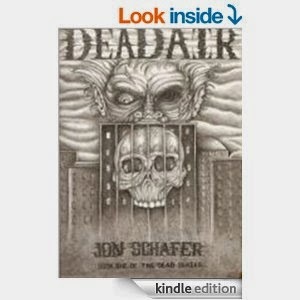 Dead Air by Jon Shafer. In Clearwater, Florida, Steve Wendell is following the stories of people attacking each other, but is unaware of the severity of the situation. When Heather Johansen, a Sheriff’s Deputy who is interested in Steve as more than a friend, tells him the real story of cities being overrun by the dead, Steve makes plans to barricade himself in the fifteen story bank building where the radio station he manages has its suite of offices. I suddenly felt in the mood for a zombie book whilst reminiscing about 'The Walking Dead' and I came across Dead Air. What initially struck me was the amount of positive reviews it had on Amazon. Normally when I stumble upon such type of books they're usually a mixed bag in terms of reviews. Some positive but most often than not negative - either complaining about the characters or storyline, or in fact both. Opening few chapters were as I expected and - like all the other zombie books I've read -described the zombie virus outbreak and how it all started. However, unlike most of those books, I wasn't bored witless and I thought the beginning of Dead Air was brilliant. Well, not the actual reason of how the zombie outbreak started - I thought that was a bit out there - but the tension that the author created when he described the slow, initial, almost serene turn from normal pleasant person to a flesh devouring monster. The suspense at wondering if that person was a zombie filled me with nervous anticipation and I actually had some semblance of dread whilst reading, which was a refreshing change to the usual eye rolling that normally accompanied these type of books. Simply put - it was done right. Zombies were actually scary to read. In terms of characterisation, the story focused mainly on Steve Wendell, a radio station manager. As far as hero's go he was exactly the type of person you'd want by your side in such a crisis. He was calm, composed and a leader. And not your stereotypical Rambo impersonator but instead someone who used brains over brawn. In fact that's something I liked overall about the book - the story wasn't like an encyclopaedia of every gun under the sun like most authors are contagious of (pun intended). As the book wore on the early promise began to dwindle away when the author introduced more character POVs. Personally, I really hate it when characters constantly change and so I didn't enjoy it when the scenes shifted away from Steve. What can I say, I'm a one-man type of....erm....I mean I'm a one-woman...anyway I'm sure you get the point. This is a zombie book (just in case you forgot) but there actually wasn't a lot of zombie craving action. Rather most of the book was contained behind the walls of Steve's radio station where the group of survivors were holed up in. The story focused more on the logistics of staying safe. Which suited me as I'm more curious learning of how one would go about being hydrated and fed in such dire predicaments instead of charging headlong into a swarm of zombies with just a hand-knife. I know I'm probably in the minority when I say that and die-hard zombie fans will no doubt be shaking their heads at me, scoffing 'amateur' under their breaths. One of the better zombie apocalypse stories I've read and I would definitely recommend it to fans who have sporadic renewals of enthusiasm for such books.